TripAdvisor’s Certificate of Excellence award four years running – 2014 to 2017. 2016 Guest Review Award from Booking.com for a 9.8 (out of 10) score. Tom and Dan were VERY lovely, friendly, offered to take care of anything we needed. They also provided specific recommendations for our time in Vermont. Dan’s cooking was a delightful surprise–never the same thing twice! My husband is a vegan, and Dan did his best to make sure he got amazing dining options, as well. A group of regular visitors were in town for the quilting convention, but we did not feel left out at all, as Dan and Tom made us feel very welcome! Tom keeps your coffee cup full at all times at breakfast. The house is beautiful and has truly wonderful gardens that wrap around the property–so much lavendar! Room four has an en suite with a standing shower, plenty of pillows and blankets, and replacement toiletries for pretty much anything you’ll need. There is also a “guest pantry” with a fridge on the second floor, with complimentary sodas and water, and space to leave leftovers for your restaurant adventures (of which you will want to have many!). We could control our own thermostat, and housekeeping took care of the room while we were out during the day. Tom and Dan know how to host. 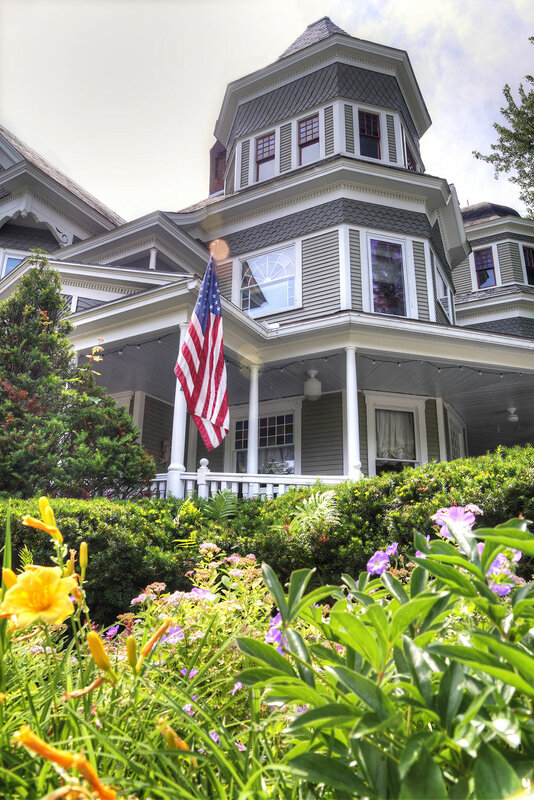 Their B & B is a beautifully kept Victorian house with tasteful furnishings that mix modern comfort and historical authenticity. Our room was well appointed, spotless and comfortable. Breakfast was amazing. Fruit served with a light dressing of lemon and fresh tarragon, blueberry muffins, a middle-eastern baked egg dish with cilantro/parley pesto and flat bread or pancakes with bacon. What a find! The Sinclair was recommended by a friend that lives in the area. We were having an early annual “FriendsGiving” and this was the perfect choice! I was so pleased with the tasteful style of the open spaces (one with fireplace) dining room and of course, our room (I believe was #2). This property is extremely well maintained and very clean. There were always delicious sweet treats in the dining room, a very well stocked area in the upstairs nook complete with Keurig Coffee/Tea, half and half, water and sodas. Glasses/cups and plenty of room are in the refrigerator for your wines/cheeses. The gourmet breakfasts were fabulous – delicious and a work of art. You will not be disappointed! This B&B is gorgeous. It lived up to and surpassed our expectations. It was just as I had always imagined a New England stay would be…and more. It deserves the great reviews it has here on TripAdvisor. We visited in October as part of our trip leaf peeping trip from Boston, through Maine, New Hampshire, Vermont and finally Cape Cod. We stayed in 8 different places and this was head and shoulders the best. The house is beautiful, cosy and welcoming, spotless and elegant. There are 2 reception rooms to relax in, a lovely breakfast room, beautiful staircase, cosy warm and well appointed bedrooms & en-suites and a separate room which contained a fridge with sodas, water, milk, juice – all part of the package – for you to use freely. There is a Coffee/tea machine with pods of many flavours and varieties and clean mugs in which to make your chosen drink. This is available 24/7. There is also a drawer which contains everything that you may have forgotten – toothbrushes, toothpaste, sewing kit, razors, pain killers (brilliant idea) ladies sanitary supplies etc etc. They really have thought of everything. Our room (4) was lovely, it was bright and airy, had 2 windows, a TV, great shower, very comfy bed, bathrobes, slippers, hairdryer, toiletries, fluffy towels. We slept very well and felt very comfortable here. We were looking for a weekend getaway in the mountains and found this place that luckily had one room still available. Tom and Dan are wonderful hosts who accommodated our needs in many ways. For example, we arrived late on the first night — almost after midnight after the fireworks at Burlington, Dan assured us that the room would be available. The breakfast was also amazing. They paid attention to the details and provided us with all that we asked for, no eggs, vegetarian food, etc. Like all other reviews mentioned, the room was so beautiful and cozy. There is a small box in the bathroom that included things one could easily forget. Coffee and bottled water on our floor. Very considerate. We hope to come back again soon. For more lodging reviews, read about the Sinclair Inn Bed & Breakfast on: TripAdvisor, Booking.com or Yelp.